An investigation into a council-run company that had its own rugby hospitality box has found "no evidence" of fraudulent activity. A 10-page report by an independent officer stated that NEA Properties - owned by cash-strapped Northamptonshire County Council - was run correctly. The company spent more than £1.5m on unspecified "projects" over a 10-year period without external checks. A council spokesman said the report "exonerated" its staff. Nick Graham, monitoring officer at Oxfordshire County Council, carried out the investigation into the firm, which was dissolved in January 2018. It was commissioned by Northamptonshire County Council in September after questions were asked about its spending, the Local Democracy Reporting Service said. 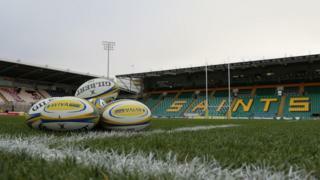 Among the "projects" investigated was an £80,000 grant to Northampton Saints Rugby Club in 2014, which Mr Graham said "accorded with the stated aims and objectives" of the firm and resulted in the council receiving "private use of a 16-person executive box" as a "reciprocal goodwill gesture". A 2015 flypast involving a vintage plane was also looked into but Mr Graham said there was "no evidence this was an inappropriate use of funding". He concluded that "proper monitoring and audit was undertaken" by the company and added: "There is certainly no evidence of any fraudulent activity on the part of officers or members in relation to the activities of NEA Properties or the Northamptonshire Enterprise Partnership. "I would emphasise that I have had to base my conclusions on the limited information that is available. "That may be in part because of some uncertainty regarding the record-keeping, or indeed just simply given the passage of time that information is no longer available." A council spokesman said the investigation "exonerated councillors and officers from any fraudulent activity" but steps had since been taken to "strengthen governance processes". Labour councillor Gareth Eales, who pushed for the investigation, said it was "wholly inappropriate" for the council to spend public money when it was "on the brink of bankruptcy".